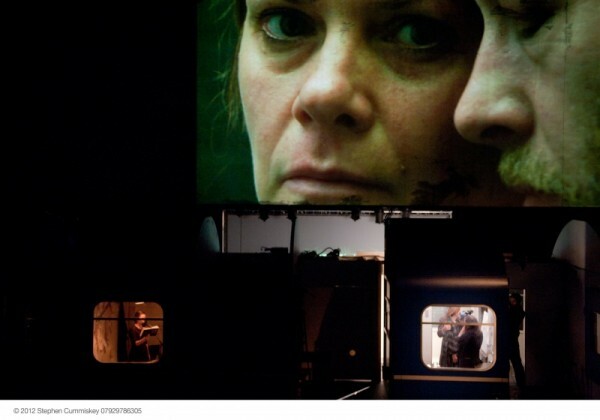 Andrew Haydon in conversation with Katie Mitchell: on German Theatre culture. A Note on the Text: rather than trying to turn a 45-minute conversation into a neatly packaged conventional “interview” in which half-quotes and thoughts do little more than lend supporting weight to the writer’s thesis, I have left pretty much the entire conversation intact. As a result, there are parts where threads get lost, never returned to, and I irritate myself by not asking the (retrospectively) correct follow-up question, or jump in too quickly on a train-of-thought. 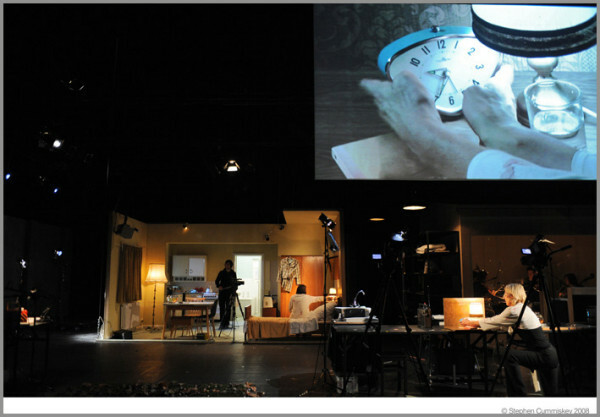 The conversation takes place at a table on the stage of the Schaubühne’s second stage where Mitchell is rehearsing her production of Duncan Macmillian’s play Atmen. The punctuation is a compromise between trying to capture how we spoke and “proper” written English. Katie Mitchell: …it’s just they’re very serious intellectuals. I mean, they’re very serious. About culture and its function and its purpose. And that sets the bar very high for anything you make. And it’s scrutinised at a very high and intense level and not for superficial factors. Katie Mitchell: No. They wanted to know how far it would go and how thorough it would be. And the moments of frustration from the viewer were to do with the lack of thoroughness of the execution of the idea. AH: Were the moments of frustration? KM: Yes. Just… different actors struggle with the request to play the re-enactment. But different versions of struggles. So Julia Wieninger completely understands it and can play it totally and other actors just – getting their head round the practicalities of how you do two things at once – struggle to execute it as perfectly as I think they want to. But, of course, the show belongs to the young women. AH: Yes! Can we talk about that? Because I’ve read your book and I have friends who have done your directing course at the NT and you talk about naturalism and about knowing the back-story of the character and being completely immersed in the part in a completely naturalistic way – to the extent that there are rooms off-stage where the actors go and continue to be in character. And then those characters walk backwards up the stairs… How does that work? KM: It’s just an issue of genre. All of that psychological work has been done. So, we spent three weeks doing character biography and improvisations as a full group and then obviously in our version of things in their heads these characters from the bronze-age died and what happened to them is that they went into darkness and then five seconds later they were pulled out of that, back to life, had blindfolds pulled on them, were transported in lorries to an entirely modern location and asked to re-enact… And told that something awful would happen to a loved one if they didn’t. And that’s what they’re playing. It’s completely thorough. KM: …until, of course, the reverse. That’s them doing naturalism but at different speeds. KM: So they’re still doing naturalism, it’s just at a different speed. I did try a lot in the UK to investigate time and memory and perception in that way by using different speeds but it was misunderstood, I think, or maybe I executed it poorly, so they got very tired of it and called it “a trope”. I think “a trope” is what they called it. Or like a stylistic device that you would repeat for the sake of it. Of course, that wasn’t my aim. But when I came here: if you say to German actors, I would like to do ten minutes of naturalistic action forwards. And then backwards. They completely *are* interested in whether that is do-able and how to do it. And the audiences find that very engaging because they realise that its an investigation of an idea. It’s not a “wilful trope”. __ trying to look at how layers of time and history function. The amount time between now in Hamburg and then in the bronze age. But the genre isn’t naturalism in the evening you’ve seen. It’s closer to surrealism or symbolism. So, obviously we talked a bit about genre because they don’t do naturalism here in Germany They really don’t like it. AH: Except in the commercial theatre, a bit? KM: But [commercial theatre]’s just totally disregarded because – it’s topsy turvey – the commercial sector here is completely disregarded. AH: The critics don’t have to go. KM: They don’t have to go, no. No one takes it seriously, and the subsidised sector is what carries the weight in their society. For us it’s almost becoming the other way round. AH: Yes! I saw Simon [Stephens] yesterday because he was over for Morning which Sebastian [Nübling] had at the Gorki for two nights and he was saying that everybody introduces him now as the guy who wrote Curious Incident now because it’s gone into the West End and it’s huge and it’s running forever and bla bla. And, well, it’s a mistake. KM: That *was* a good show. My team were at their best. And we can’t revive it. It’s too expensive. KM: Yeah. It’s too small for Hamburg. We’re seeing if we can try and get it to England. It’s tough formally and it’s tough from the feminist perspective: you can’t dispute with it. And the writer [Friederike Mayröcker] is seriously good. AH: That was the one thing I didn’t really have any way to appreciate properly because […my German isn’t that good]. KM: Mmm. You can’t have her in translation. It’s so beautiful, the Austrian-German, that you can’t have it in translation. But she’s a master… Just a brilliant woman. But, the TheaterTreffen ceremony… You know we have our ceremonies like the Olivier Awards, which are just so glitzy, and whereas the TheaterTreffen one… First of all: there isn’t a prize for “The Best”. It’s acknowledged that you can’t have a “best”. You have ten selected [shows], and they all have conversations with each other. I mean, that’s already a bit more sophisticated in terms of looking at anything like live performance; because it would be very hard to chose a “best”, I think. Then, in the actual ceremony, because it was a Thalheimer show that was on stage, maybe also because that’s how they do their ceremonies, totally black, empty theatre, and on stage left a tiny podium with an exquisitely designed neon rectangle. And that’s it. For their major theatrical ceremony. And then the minister for the arts came onto the podium. Stage left. Not in the centre. Not stage right. And announced that because of the economic circumstances they were, therefore, *raising* arts subsidy. [KM laughs incredulously] It was just incredible. I thought: I’m on another planet. Can you imagine that? Can you imagine just the event like that, and then the raising of the subsidy because of economic shifts, changes, and the realisation that you would need a bit *more* culture, actually, when things get bad economically. I mean, that’s… It’s just a different way of thinking. AH: I get in trouble for keeping on about how it’s *actually* *right*. But, it is. And it demonstrably works better: Germany’s economy is in much better shape than the British. They have all this stuff and – I mean, this is probably naïve utopianism, but – it feels like a less troubled country. Really. KM: Yeah, I think it is. I mean, it’s difficult to know what’s… I think there are hidden things. KM: But the past doesn’t come out for a long time. So, I must have worked here since Wunschkonzert in 2008 in Cologne – about seven years – but I have colleagues, really long term working colleagues, and it takes about two to three years before that becomes something that’s discussed – the past, the war. And it is, of course, it’s in the heart of everything; all cultural expression on stage; all artistic expression comes from the re-imagining of society after The Bad Thing was done. I often wonder about us. Because we won a war maybe there wasn’t the same need to examine some of our violent actions; like the bombing of Hamburg; the bombing of Cologne. Of course, working all the time in those cities that were bombed I really noticed the absence of being told about it in my education. That was totally absent. It was quite a shock. I bumped into it in my forties. AH: Yes. I went to Essen recently and that’s worse than anywhere else I’ve seen. In terms of: you look round and you think: my God, there is *nothing* that’s older than 1945. Whereas like, in Cologne they at least left the Cathedral to navigate by. KM: They did, but only 10 per cent of the buildings were left in Cologne. KM: No, it was very bad. In the Sebald book On The Natural History of Destruction they talked about how… there are descriptions of people melting in the streets of Hamburg. KM: I struggled in Hamburg. There’s a very long street I lived on called Sierichstraße, which is an oak tree avenue, so you constantly get attacked by acorns, it’s the most beautiful… They’re always popping. Pop! Pop! Pop! As they fall off on the cars or the pavement. And I was walking down, trying to work out where the bombs fell on the basis of the architecture – what period it was – on this endless street. And then all of the amazing plaques to commemorate where Jewish people lived , actually describing when they were deported and where they died. It’s brutal, isn’t it? That amazing man who did all the plaques Gunter Demnig. KM: I don’t know whether it is, but that’s what it feels like. It’s a strange yellow-ness, on the tube, on the postal service, to avoid the redness of all of those Nazi events. KM: But, yes. It’s an amazing privilege to be here. KM: Well, I literally did it because Karin Beier was an old friend of mine. AH: Was Cologne her first building? KM: Yeah. And I’d always wanted to do that Franz Xavier Kroetz play, Request Programme [Wunschkonzert]. AH: And that’s got no words. AH: It’s just a radio playing. KM: Yes. It’s a woman in the last hours of her life. And its a very political play. It’s really carefully thought out politically by Kroetz who’s very, very left-wing. It’s the result of a lot of very careful study about suicide in a certain social catchment area, and what happens to people, and why people do that. And it’s very banal. It’s the awful banality of despair. It’s just a woman who comes home from an office, does her needlework, makes a cup of tea and listens to a rather sentimental request programme where loved ones leave messages for loved ones and is totally alone and then takes an overdose. Pfft. End of play. [small (compassionate) laugh] But we did it with cameras. And that was a big surprise: no one was expecting that. AH: I was going to ask a bit of an obvious question about the play: does she know that she’s going to kill herself at the beginning of the play? KM: You’d have to make a decision. AH: /that she’s come home to… Christ. AH: Is that where that strand of work started? The video stuff, and also, I guess, the more “intimate” stuff? KM: Well, it started with Waves really […] Waves preceded it. I would say that Wunschkonzert… Waves was where it started, with Virginia Woolf; just such an amazing writer, and very on the edge; the writing. AH: Exactly. Compared to other stuff you’d done. What was the inspiration? KM: I’d done a special paper on Woolf at university, so I’d always loved the novels, and whilst I was working, doing shows, I got a NESTA grant – National Endowment of Science and The Arts – I did two years alongside making I did two years of R&D and of course, I think all directors have got little pet projects – hunches about things, but they don’t know how to do them, and I spent a lot of time looking at Waves during that period. So, I suppose on the outside you just saw the shows evolve in a way that was logical and clear, but privately there were other processes going on for two years and the climax of that was doing Waves. AH: I read – I think you did an interview with Dan Rebellato… And you talked about… There was the Dogme thing? KM: Yes. That was at the same time. But that failed really. We tried that out at the Royal Court and that didn’t really work. We played, sometimes, to audiences of two. Or three. It was called Night Songs. By Jon Fosse. But that was just like a little flurry of activity and then it clearly didn’t work, so I went back behind the scenes to work on other things. Then I came back into the UK and I found myself doing a different type of work for a long time, actually nearly twenty years. But always in the back of my mind the things that really interested me weren’t fully completely articulated. KM: No. No. ‘Course not. KM: [laughs] No, I was very encouraging. Because you never know who’s going to make really good work. And there are lots of formats for making work in the UK. But maybe slightly fewer formats than out here, or different ways of making work. And maybe that way of thinking – linear narrative, classic play, naturalism – doesn’t fit every young person who wants to direct. And it’s where that strand of impulse, where does that go to in the UK? If that isn’t represented, those other ways of perceiving or other ways of wanting to work, then I think something’s sort of missing. AH: Although, to be honest, I think things – this isn’t really an “interview question” anymore but – I think things are getting better. KM: Yes, it’s definitely shifting. I think it’s hopeful with Vicky [Featherstone] there. And I think it’s hopeful with Rufus [Norris] there. I think it’s time for a change. I didn’t go to the 50 year celebration [at the National Theatre] but the, uh, writing out of women was “quite interesting”. Probably unconscious, but “interesting”. I think I’d done 16 shows there over three managements… And it’s not so much to do with me, because I can see the narrative, but it’s just like: what does it mean for other women? What does that mean? What signal does that give about an artform? This is the first part in a two-part interview. Read the rest of Andrew Haydon’s interview with Katie Mitchell here.